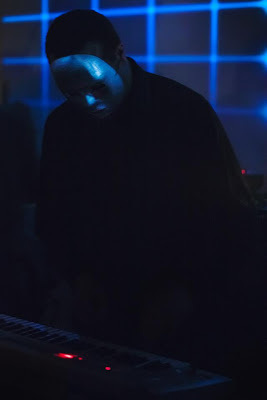 Gerald Donald returned to Dublin as Arpanet (he played at the seated Sugar club as Dopplereffekt in 2008) and played a suitably mysterious semi private party at a disused warehouse venue on the banks of the Grand Canal close to the eastern edge of the city. I was there earlier and heard them sound-checking (I did get to meet him) and got to run through my own technical requirements. At that time the building had been freezing but by 9pm when the doors opened the main room was heated by a large wood burning stove which was surprisingly effective and once the room filled with about a capacity 400 people it was fine. It’s a cool new venue with seating from recycled pallets and large pieces of sculpture and paintings dotted around and I even saw that a table tennis table had been unfolded and was being played in one corner as I did my DJ set. I was honoured to be asked to open the event and felt my talk and slides went down well (the full text can be read here), but I kept it short to 20 minutes just in case. This was followed by the first showing in this country of Hydra Decapita by The Otolith Group. I had never seen it myself up to this point and liked it. It seems to feature Gerald Donald’s voice at about 4 points and has a blue text scrolling across the screen with images of the ocean surface, some electronic snow like animation and more. I did notice the line ‘rival interpretations’ of Drexciya’s message and the ‘archaeologists of the future’ stuff about the Drexciya star and wondered if those were references to things I’ve written in DRL in the past. I was back up next followed by another DJ, Kenny Hanlon from Apartment Records. At 12.30 Gerald Donald appeared, dressed in black and wearing a silver mask as he took to the stage. The audience was very into it all the way through and very close to him and his keyboard. There was just a tiny stage and the DJ decks were behind him. 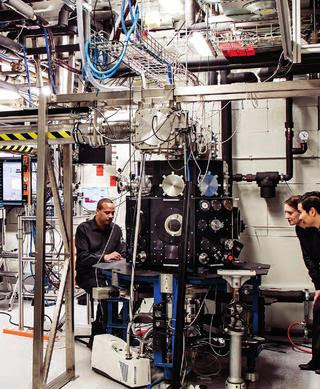 All the tracks were unreleased (some label needs to ask him about putting this stuff out) and more accessible than his current work as Dopplereffekt. However there was still about a 50/50 split between the more easily accessible and more experimental parts of the set. The last few tracks were really amazing though and I would hope these at least might come out someday. The crowd was too tightly packed for anyone to really let loose and dance but it was grooving and making an appreciative noise, as well as taking endless photos and videos. The visuals featured Einstein’s hand written theory of relativity and the globe image from the first Arpanet album as well as the light cone from the second. He played for about an hour and afterwards by chance my girlfriend and I were ushered into an upstairs room by one of the promoters and we got to chat some more with him again before he left. 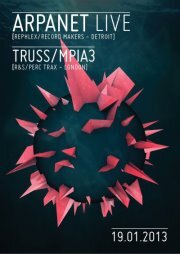 We then checked out the amazing DJ set in the other room from Truss who I had also been chatting with earlier. There was a lovely flow to the whole event with no hassle, which the organizers, Shay D Promoters, had gone to a lot of effort to be the case. There is already a video of it up at this link. Zerkalo remain very quiet for them but there is a new video for INKAMERA, one of Victoria Lukas's solo projects. 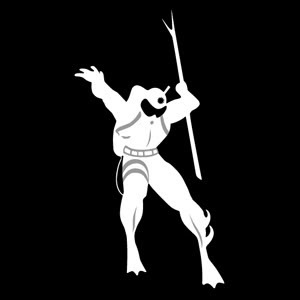 The third installment of Drexciya's Journey of the Deep Sea Dweller was deplayed due to printing problems but is out now from usual places.